How are we implementing our Mission Statement in year two? Read more here! A few classrooms moved and several staff have been added. Click to open. 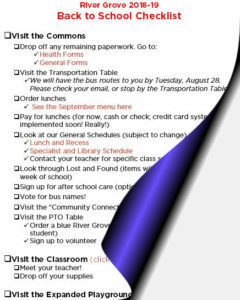 Drop off any remaining paperwork and order lunches in the Commons, visit your new classroom and teacher, and tour the new playground and buses! NOTE: This is your last chance to visit Lost and Found from last year. After the Back to School Nights, the items will be donated to the health office or Goodwill. Curriculum nights will be week of Sept 10. Watch your child’s backpack and your email for info. Kid-friendly entrees! More fruits and vegetables! Let us know what your transportation needs are. Order your blue River Grove T-shirts! Mark your calendars: Fall Social and Fundraiser! Friday, Sept. 21, from 5-8pm. Come join us for dinner, a DJ, kids’ games, and silent auction. We will be holding it at the Withrow Ballroom this year!